( January 17, 2015, New Delhi, Sri Lanka Guardian) It did not take the defeated Mahinda Rajapaksa even the results of the presidential election to be formally notified before moving out of Temple Trees, his official residence. 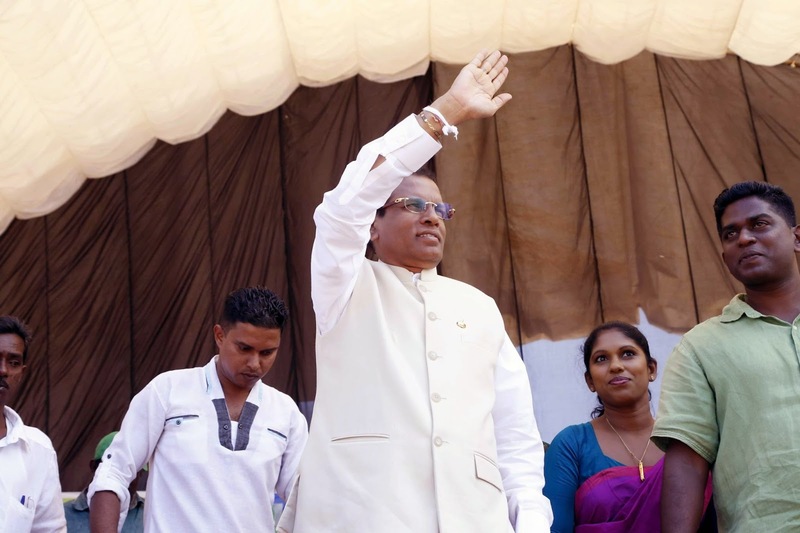 And, by the evening of January 9, barely 24 hours after the polls had closed, the victorious Maithrapala Sirisena was sworn in as the new President of Sri Lanka. The sequence of events is important, if only to emphasise something that needs reiteration: that Sri Lanka is a vibrant, robust democracy. Most important, democracy has thrived uninterrupted since the island secured independence in 1948. Apart from India, it is the only other country in South Asia that has not experienced a military coup. The LTTE was notorious for their use of women as saboteurs, children as soldiers and ordinary people as human shields. The only way to deal with it militarily was to insist on a total, unconditional surrender — a goal that Rajapaksa realised. This is something the “international community” and their human rights surrogates chose to deliberately not understand. This is not to suggest that there haven’t been transgressions. A bitter, 30-year civil war against one of the most fanatical and brutal secessionist forces has inevitably created distortions that need to be ironed out now that the LTTE is primarily a force that thrives in the Tamil diaspora. The Tamil minority that has its grievances and differences with Colombo voted in large numbers on November 8. So did the Muslim minority that is fearful of any rise in Sinhala chauvinism. Together their resounding vote against Rajapaksa — and, by implication, in favour of Sirisena — tilted the balance against the incumbent. However, to interpret the outcome as a consequence of Tamil and Muslim consolidation against the victor of the civil war is facile. Sirisena won because, in addition to the support from the minorities, he was able to divide the Sinhala Buddhist vote. Rajapaksa may have got a majority of the votes in the south of the island but Sirisena was only narrowly behind. His victory is significant because it was the result of a rainbow coalition of the Sinhala Buddhist, Tamil and Muslim votes. The important thing is that Sri Lanka witnessed an extraordinary high turnout — unlike 2005 and 2010 when large parts of the Northern and a slice of the Eastern Province was disturbed. There may have been election clashes — hardly unfamiliar to India — and some crude misuse of the state-controlled TV channel for partisan ends — again, a spectacle quite familiar to India. But the quality of democracy was broadly unimpaired. Yet, go back a few days prior to voting. Then, you had a spate of interventions by West-based human rights organisations warning of violence and worse, unleashed on the people by the Rajapaksa regime. For example, there was one David Griffiths, the Deputy Asia Pacific Director of Amnesty International piously proclaiming: “Reports of a potential organised plan to obstruct voters on election day — allegedly orchestrated by the Government through the military — is also a matter of grave concern.” Other reports hinted darkly of the Rajapaksa brothers orchestrating an army coup to prevent the expression of popular will. In the light of the massive turnout of voters on Election Day and the exemplary transition that took place the next day, these assertions seem laughable. However, imagine for a moment what would have been the reaction of the so-called “international community” in the event that — as was initially expected — Rajapaksa had narrowly edged out his challenger. I have little doubt that the integrity of the election would have been called into question and Rajapaksa would have been charged with “stealing” an election. Encouraged by Western do-gooders, there would have been a call for street protests and demands for sanctions against the regime. It is necessary to underline the potential havoc that unrepresentative bodies can create because Sri Lanka has been a long-term victim of their motivated propaganda. Ever since the LTTE was put out of business, the human rights-wallas have been shouting “war crimes” from the rooftops. No doubt the last stages of the civil war in 2009 saw considerable collateral damage and loss of civilian life. But this was a war where the rebel forces were not known for their adherence to the Geneva Convention. Now that Rajapaksa, the architect of the military victory, has got his comeuppance, it is likely that the diplomatic pressure on Sri Lanka will ease considerably. President Sirisena will not be in any position to allow international human rights observers to rake up the past — the innate self-respect of Sri Lankans will not allow it. So, will the UN Human Rights Council age vote to censure Sri Lanka for its alleged lapses? If it chooses to drop the resolution, it will be a positive step. But allowing bygones to be bygones will also signal that the strictures were really aimed at the Rajapaksa regime. Now that Rajapaksa has departed to mull over the big mistakes — particularly cronyism and sycophancy — that cost him the presidency, will Sirisena be given a breather? I suspect he will be given the requisite breathing space to negotiate a working relationship with the Tamil National Alliance. Since the West was really looking for a regime change in Sri Lanka, it will be inclined to let him first work out a viable internal settlement that balances Sinhala Buddhist concerns with Tamil aspirations. Having quite rightly refused to get too embroiled in Sri Lanka’s domestic politics, India has just two responsibilities: to give the new regime a helping hand and prevent the competitive politics of Tamil Nadu from casting its shadow across the Palk Strait. For the remainder, Sri Lanka has quite conclusively shown that it has its own internal checks and balances that work best without outside interference.